A consul is an official representative of the government of one state in the territory of another, normally acting to assist and protect the citizens of the consul's own country, and to facilitate trade and friendship between the peoples of the two countries. A consul is distinguished from an ambassador, the latter being a representative from one head of state to another. There can be only one ambassador from one country to another, representing the first country's head of state to that of the second, and his or her duties revolve around diplomatic relations between the two countries; however, there may be several consuls, one in each of several main cities, providing assistance with bureaucratic issues to both the citizens of the consul's own country travelling or living abroad and to the citizens of the country the consul resides in who wish to travel to or trade with the consul's country. In Classical Greece, some of the functions of the modern Consul were fulfilled by a Proxenos. Unlike the modern position, this was a citizen of the host polity (in Greece, a city state). The Proxenos was usually a rich merchant who had socio-economic ties with another city and who helped its citizens when they were in trouble in his own city. The position of Proxenos was often hereditary in a particular family. Modern Honorary Consuls fulfil a function that is to a degree similar to that of the Ancient Greek institution. Consuls were the highest magistrates of the Roman Republic. The term was revived by the Republic of Genoa which, unlike Rome, bestowed it on various state officials, not necessarily restricted to the highest. Among these were Genoese officials stationed in various Mediterranean ports, whose role included duties similar to those of the modern consul, i.e. helping Genoese merchants and sailors in difficulties with the local authorities. The Consolat de mar was an institution established under the reign of Peter IV of Aragon in the fourteenth century, and which spread to 47 locations throughout the Mediterranean. It was primarily a judicial body, administering maritime and commercial law as Lex Mercatoria. Although the Consolat de mar was established by the Corts General (parliament) of the Crown of Aragon, the consuls were independent from the King. This distinction between consular and diplomatic functions remains (at least formally) to this day. Modern consuls retain limited judicial powers to settle disputes on ships from their country (notably regarding the payment of wages to sailors). The Consulado de mercaderes was set up in 1543 in Seville as a merchant guild to control trade with Latin America. As such, it had branches in the principal cities of the Spanish colonies. The connection of "consul" with trade and commercial law is retained in French. In francophone countries, a juge consulaire (consular judge) is a non-professional judge elected by the chamber of commerce to settle commercial disputes in the first instance (in France, sitting in panels of three; in Belgium, in conjunction with a professional magistrate). 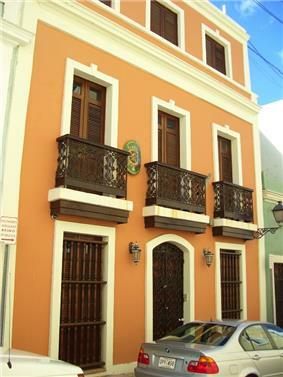 Consulate of Belgium in San Juan, Puerto Rico. 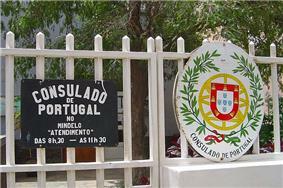 Consulate of Portugal in Mindelo, Cape Verde. The office of a Consul is termed a Consulate, and is usually subordinate to the state's main representation in that foreign country, usually an Embassy, or High Commission between Commonwealth countries, in the capital city of the host state. Like the term embassy, the word consulate may refer not only to the office of consul, but also to the building occupied by the consul and his or her staff. The consulate may share premises with the embassy itself. A Consul of the highest rank is termed a Consul-General, and his or her office a Consulate-General. He or she typically has one or several Deputy Consuls-General, Consuls, Vice-Consuls and Consular Agents working under the consul-general. Consulates-general need not have their offices in the capital city, but rather could have them in the most important/appropriate cities in terms of bilateral relations (commerce, travel, etc.). In the United States, for example, most countries have a consulate-general in New York City (the home of the United Nations), and some have consulates-general in several major cities (e.g., Atlanta, Boston, Chicago, Houston, Los Angeles, Miami, San Francisco). The same is the case for other large countries like Germany - where many consulates-general are located in cities such as Bonn, Frankfurt, Hamburg, and Munich; the Russian Federation - where many consulates-general are located in St. Petersburg, Vladivostok, etc. ; Canada - where many consulates-general are located in Toronto and Vancouver; Brazil - where many consulates-general are located in Rio de Janeiro and Sao Paulo; and Australia - where many consulates-general are located in Sydney, Melbourne, Perth and Brisbane. Consuls of various ranks may have specific legal authority for certain activities, such as notarizing documents. As such, diplomatic personnel with other responsibilities may receive consular letters patent (commissions). Aside from those outlined in the Vienna Convention on Diplomatic Relations, there are few formal requirements outlining what a consular official must do. For example, for some countries, consular officials may be responsible for the issuance of visas; other countries may limit "consular services" to providing assistance to compatriots, legalization of documents, etc. Nonetheless, consulates proper will be headed by consuls of various ranks, even if such officials have little or no connection with the more limited sense of consular service. Activities of a consulate include protecting the interests of their citizens temporarily or permanently resident in the host country, issuing passports; issuing visas to foreigners and public diplomacy. However, the principal role of a consulate lies traditionally in promoting trade—assisting companies to invest and to import and export goods and services both inwardly to their home country and outward to their host country. And although it is never admitted publicly, consulates, like embassies, may also gather intelligence information from the assigned country. In many cases, such as the United States, consulates are established for specific consular districts of another nation-state. For instance, the consular representation in India and Bhutan is divided into 5 regions, one of which, the New Delhi Consular District (based at the U.S. consulate in New Delhi), covers the Indian states of Delhi, Haryana, Himachal Pradesh, Jammu and Kashmir, Punjab, Rajasthan, Uttar Pradesh, Uttaranchal, and the Kingdom of Bhutan. Consular districts are demarcated to serve only citizens resident within the district with non-immigrant visas. Contrary to popular belief, although many of the staff of consulates may be career diplomats, they do not generally have diplomatic immunity (unless they are also accredited as such). Immunities and privileges for consuls and accredited staff of consulates (consular immunity) are generally limited to actions undertaken in their official capacity and, with respect to the consulate itself, to those required for official duties. In practice, the extension and application of consular privileges and immunities can be subject to wide discrepancies from country to country. Consulates are more numerous than diplomatic missions (e.g., embassies), since the latter are posted only in a foreign nation's capital (exceptionally even outside the country, in case of a multiple mandate; e.g., a minor power may well accredit a single Ambassador with several neighbouring states of modest relative importance that are not considered important allies), while consular ones are also posted in various cities throughout the country, especially centres of economic activity, or wherever there is a significant population of its citizens (expatriates) in residence. Consulates are subordinate posts of their home country's diplomatic mission (typically an embassy, in the capital city of the host country). Diplomatic missions are established in international law under the Vienna Convention on Diplomatic Relations, while consulates-general and consulates are established in international law under the Vienna Convention on Consular Relations. Formally, at least within the US system, the consular career (ranking in descending order: Consul-General, Consul, Vice-Consul, Honorary Consul) forms a different hierarchy from the diplomats in the strict sense. However, it is common for individuals to be transferred from one hierarchy to the other, and for consular officials to serve in a capital carrying out strictly consular duties within the consular section of a diplomatic post; e.g., within an embassy. Between Commonwealth countries, both diplomatic and consular activities may be undertaken by a High Commission in the capital, although larger Commonwealth nations generally also have consulates and consulates-general in major cities. For example, Toronto in Canada, Sydney in Australia and Auckland, New Zealand, are of greater economic importance than their respective national capitals, hence the need for consulates there. When Hong Kong was under British administration, diplomatic missions of Commonwealth countries, such as Canada, Australia, New Zealand, India, Malaysia, and Singapore were known as Commissions, but after the transfer of sovereignty to China in 1997, they were renamed Consulates-General. with the last commissioner becoming consul-general. Many of these commissioners and consuls-general have served elsewhere as ambassadors, and some of them still report directly to the foreign ministries of their sending countries, instead of reporting through the ambassadors in Beijing. A Consul General is an official who heads a Consulate General and is a Consul of the highest rank serving at a particular location. A Consul General may also be responsible for consular districts which contain other, subordinate consular offices within a country. The Consul General serves as a representative who speaks on behalf of his or her state in the country to which he or she is located, although ultimate jurisdiction over the right to speak on behalf of a home country within another country ultimately belongs to the single ambassador. It is abbreviated "CG" and the plural form is consuls general. In most embassies, the consular section is headed by a Consul General who is a diplomat and a member of the ambassador's country team. Some consuls are not career officials of the represented state at all; some are locally engaged staff with the nationality of the sending country, and in smaller cities, or in cities that are very distant from full-time diplomatic missions, a foreign government which feels that some form of representation is nevertheless desirable may appoint a person who has not hitherto been part of their diplomatic service to fulfill this role. Such a consul may well combine the job with his or her own (often commercial) private activities, and in some instances may not even be a citizen of the sending country. Such consular appointments are usually given the title of honorary consul. As a matter of U.S. policy, honorary consular officers recognized by the U.S. Government are American citizens or permanent resident aliens who perform consular services on a part-time basis. The limited immunity afforded honorary consular officers is specified in Article 71 of the VCCR. Such individuals do not enjoy personal inviolability and may be arrested pending trial if circumstances should otherwise warrant. However, appropriate steps must be provided to accord to such officers the protection required by virtue of their official position. In addition, the consular archives and documents of a consular post headed by an honorary consular officer are inviolable at all times and wherever they may be, provided they are kept separate from other papers and documents of a private or commercial nature relating to other activities of an honorary consular officer or persons working with that consular officer. Notwithstanding their other roles, honorary consular officers (in the widest use of the term) also have responsibility for the welfare of citizens of the appointing country within their bailiwick. 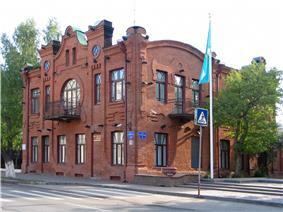 For example, the Embassy of Finland states that the tasks of Finland's Honorary Consulate include: monitoring the rights of Finns and permanent residents of Finland residing in the area in which the consulate is located, providing advice and guidance for distressed Finnish citizens and permanent residents traveling abroad to that area, and assisting them in their contacts with local authorities or the nearest Finnish embassy or consulate. Certain types of notarized certificates can be acquired through an honorary consul. Together with diplomatic missions, an honorary consul promotes economic and cultural relations between Finland and the country in question, and takes part in strengthening Finland’s image abroad. An honorary consul can advise Finnish companies, for instance, in obtaining information about local business culture and in finding cooperation partners. In the social life of 19th century Lübeck as depicted in Thomas Mann's novel Buddenbrooks - based on Mann's thorough personal knowledge of his own birth milieu - an appointment as the Consul of a foreign country was a source of considerable social prestige among the city's merchant elite. As depicted in the book, the position of a Consul for a particular country was in practice hereditary in a specific family, whose mansion bore the represented country's coat of arms, and with that country confirming the Consul's son or other heir in the position on the death of the previous Consul. As repeatedly referenced by Mann, Consul's wife was known as "Consulin" and continued to bear that title even on the death of her husband. Characters in the book are mentioned as Consuls for Denmark, the Netherlands and Portugal. From 1798 to 1883 the foreign affairs of the United States were largely the responsibility of those wearing the gold braid of U.S. navy officers. Since there were no formal diplomatic relationships with countries in many regions, the U.S. government often relied on those most experienced in trade relations – the consuls – to seize opportunities for commercial and diplomatic contacts. Early United States consuls were really chief merchant-agents, receiving but an administrative pittance (apart from "insider trading" information on port commerce) and issuing reports to the Department of State on their circumscribed duties in safeguarding American property and estates and caring for sailors and residents. American consuls undertook an informal kind of proto-diplomacy as they functioned mostly to support commerce, acting on their own authority in support of the trading community. The U.S. government, while underwriting such functions, did nothing to guarantee legal protection for American citizens or to accord judicial authority to consuls. In a notable case of 1821, an Italian sailor on the American ship Emily, Francis Terranova, accidentally killed a Chinese woman. Chinese authorities demanded that Terranova be turned over to them, and executed him when the Americans complied. Early in the 1830s, as part of American interest in expanding competitively in the Pacific region and East Asia, President Andrew Jackson and Secretary of State Edward Livingston made initiatives toward strengthening the American consular role, with respect to remuneration and the coordination of commercial and naval interests. Both were greatly influenced by the "activist" reports of Edmund Roberts, former American consul in Demerara (scene of the Demerara rebellion of 1823 that attracted British attention to the need to abolish slavery,) and by John Shillaber, the American consul in Batavia (modern Jakarta). Shillaber, a Massachusetts native, served as the American consul in Batavia between 1825 and 1832, officially resigning from that post in 1835 while in China. In 1826, in Batavia, he tried unsuccessfully to secure the authority to sign American treaties with Siam and other kingdoms in the East Indies, like Sumatra, where, in 1831, the native population attacked American shipping (which resulted in the US Navy's First Sumatran expedition a year later.) While on leave in 1831, at the request of the Department of State, he prepared treaty outlines dealing with Japan, expressing hopeful opinions about the future of U.S.-Japan relations. In 1832 Secretary of the Navy Levi Woodbury, a leading proponent of increased naval power in China, used his influence to have President Jackson appoint his friend Roberts, rather than Shillaber, as a special envoy to look into treaty possibilities. In 1832 Roberts was awarded the commission to negotiate treaties that Shillaber still expected to receive. Then in 1833 he wrote to Secretary Woodbury stating the need for a naval force in Chinese and Philippine waters to counteract the coastal piracy of the infamous Ladrones (Thieves Islands). Shillaber was discouraged at being passed over for the assignment to Siam secured by Roberts, so in 1834 he attempted to gain the even more prestigious consular post at Canton. In his letters to President Jackson and to Secretary Livingston describing the post-monopoly, pre-treaty political and commercial situation, Shillaber attempted to define himself as a "China expert" and diplomatic pundit. Shillaber's detailed correspondence preserved in his own hand among the U.S. consular despatches in the National Archives in Washington, is remarkably prescient with respect to the inevitability of Sino-British hostilities and the need to define a more assertive American position in China. He recommended that American consuls have official power to represent the government before the Chinese authorities, protect the property and rights of American citizens, make vigorous efforts to open more ports to trade, and that Americans maintain an armed naval presence in East Asian waters. Significantly, Shillaber felt that American policy should have another purpose, namely, to show the Chinese that Americans were a breed apart, different from other Westerners, especially the British, who came to do business, assume control, and wreak havoc in China. Following Roberts' treaty with Said bin Sultan, Sultan of Muscat and Oman, Richard Waters, a native of Salem, Massachusetts, was appointed American Consul from 1837 to 1845 in Zanzibar; Gilbert gives an account of the difficulties facing a neophyte American consul. ^ "Foreign Embassy Information & Publications". Retrieved 24 September 2014. ^ "Honorary consulates of Finland in the U.S. - Embassy of Finland, Washington - Consulate Generals of Finland, New York, Los Angeles : Finland in the US : Finnish Honorary Consuls". Finland.org. 2011-12-15. Retrieved 2013-12-21. ^ Long, David Foster (1988). Gold braid and foreign relations : diplomatic activities of U.S. naval officers, 1798-1883. Annapolis: Naval Institute Press. ^ See the diplomatic lists in Debates in Congress, 22nd Cong., 2nd sess., vol. 9 (appendix), pp. 131 - 132. ^ Gedalecia, David (Winter 2998). "Letters from the Middle Kingdom : The Origins of America's China Policy". Prologue Magazine (U.S. National Archives and Records Administration) 34 (4). Retrieved 15 July 2012. ^ Cotheal, Alexander I. (17 January 2008). "Treaty between the United States of America and the Sultân of Masḳaṭ: The Arabic Text" (free). Journal of the American Oriental Society (JSTOR) 4 ((1854)): 341–343. Retrieved 5 April 2012. ^ Gilbert, Wesley John (April 2011). Our Man in Zanzibar: Richard Waters, American Consul (1837-1845) (B.A. Thesis). Departmental Honors in History. thesis advisor, Professor Kirk Swinehart.